This entry was posted in Community, Events and tagged becoming alabama, immigration, migration, symposium on January 12, 2012 by Wire Eagle. AUBURN – Lutz Hermann Görgens, the Consul General of the Federal Republic of Germany, will deliver a keynote address at “Becoming Alabama: Immigration and Migration in a Deep South State,” Jan. 20-21 at The Hotel at Auburn University and Dixon Conference Center. The two-day public symposium, hosted by Auburn University’s College of Liberal Arts, will feature scholars and professionals exploring immigration and migration from Spanish exploration to the 1813 Creek War through the present. Görgens, a native of Düsseldorf, Germany, is the official representative of the German government to the Southeastern United States. During his career, Görgens has worked as a desk officer for the Federal Foreign Office in Bonn, Germany, and later as first secretary and head of the Economic Section for the Germany Embassy in Mexico. He later became a deputy consul general in Boston, head of the Economic Section in the German Embassy in Ankara, Turkey, and head of the European Internal Market Affairs Unit of the Federal Foreign Office in Berlin. He holds a Ph.D. in German history and literature from the University of Tübingen. Prominent scholars of history and political science from Auburn University, as well as other institutions, will present on topics ranging from Spanish Exploration to how Alabama’s immigrant population, including Germans, Koreans, Southeast Asians and Hispanics, among others, have shaped art, politics, education and culture in the state. 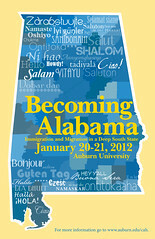 The symposium is a “Becoming Alabama” event. Designed to commemorate major Alabama anniversaries of the Creek War/War of 1812, the Civil War and Emancipation and the Civil Rights era, “Becoming Alabama” is a statewide initiative begun by the Alabama Department of Archives and History. Registration for the conference is $50. Registration for meals, which will feature keynote speakers, is separate. Students may register at a discounted rate. For a schedule and a list of presenters, visit www.auburn.edu/cah or call( 334) 844-4946. The deadline for registration is Jan. 17. “Becoming Alabama: Immigration and Migration in a Deep South State” is supported by a generous grant from the Alabama Humanities Foundation, the state office of the National Endowment for the Humanities. It is co-sponsored by the Alabama Department of Archives and History, the Auburn University College of Liberal Arts, History Department and Caroline Marshall Draughon Center for the Arts and Humanities in the College of Liberal Arts, as well as the Office of the Vice President for International Programs and the Office of Access and Community Affairs. The East Alabama Memory Project, a program of Southern Public Media Group, is also serving as a sponsor.